Onion chopped – ½ tbsp. · Skin off the kadachakka and cut into small pieces and wash.Pressure cook kadachakka with water, turmeric powder,salt and tomato for one whistle. · Meanwhile in a pan put 1 tbsp oil ,coconut,1 tbsp chopped onion, peppercorns, garlic pods and roast it till coconut become golden brown.Add coriander powder,garam masala,red chilli powder and sauté for a minutes.let them to cool. 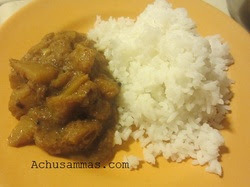 · Grind the mixture into a fine paste with water.Add this ground paste into the cooked breadfruit. Mix well and bring to boil. If want more gravy add water. 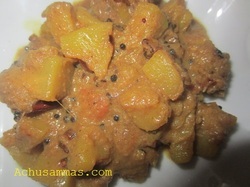 · Pour this roasted mix into the kadachakka curry. Thank you so much Poonam.I got the award from Poonam ,Kande Pohe, do a drop on Poonam's blog and enjoy awesome recipes.Something aboutAward.Copying this information from Poonam's Blog. · Copy and paste the award on your blog. Link back to the blogger who gave the award. · Pick your five favorite blogs with less than 200 followers who deserve to be noticed and leave a comment on their blog to let them know they have received the award. · Hope that the five blogs chosen will keep spreading the love and pass it on five more blogs. 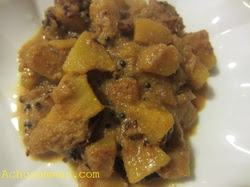 Have never tasted this, looks very yummy..
wow too good dish n congrats for the award n thanks for sharing..
Kadachakka masala sounds yummy n looks great..
Kadachakka curry,I love this a lot n prepare it in the same way..where did you find this here? kadachakka curry super aayittundu..Congrats on ur award and Thanks for passing it to me..will collect it soon..